Anybody who was around in the late seventies/early eighties will remember just how desperate things were in terms of Newcastle United’s finances. The club was really small time in its thinking and it was only the arrival of Kevin Keegan that sparked everything into life. 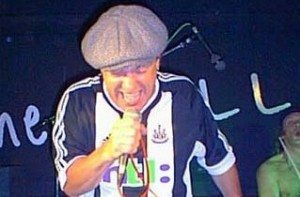 Before that though I remember the excitement when it was rumoured that local lad made good, Brian Johnson of AC/DC, was going to put in money and join the board. “It was a bit of a scam really. Jackie Milburn was such a wonderful man and he was just so worried about the way the club was going and he just said, ‘We’ve got to get some young blood in here’. It wasn’t so much buying it, Jackie Milburn took me in to see the board and he sat me down and said, ‘I’ll see you through this’. I was very excited about doing it and then after about halfway through we looked at each other and both realised that they wanted me to put in, this was about 1981, they wanted me to put half a million pound in the club. Which at the time was a fortune and for that they were going to make me an honorary board member with no decisions and no say. I realised that it was just a big, big stitch up by these greedy men who wanted more money from some silly pop star dude, who would just throw it in because of his love for the club”.